What Is The Best Rice Cooker For Brown Rice? 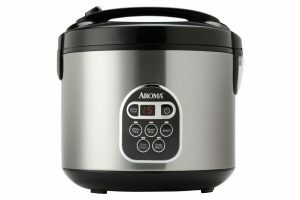 If you are asking what is the best rice cooker for brown rice then you should check out this post. I have found three of them that are great to make brown rice for you to check out. Two of them are made by the same company of Zojirushi and that is a Japanese company. The other one is an Aroma brand. The Zojirushi brand has a premium white and stainless brown color to select from and these are two different models. This brand might be a little bit high in price for some of you or might not be because everyone’s budget is different. The Aroma brand does seem to cost less than the Zorjirushi while writing this article, but it also has less functions when comparing them. If it were me, I would go with the Aroma brand if I was on a very tight budget. The price is pretty affordable to me and if I can stretch out a bit of my finances, I would definitely go with the Zojirushi brand even if I have to sacrifice on buying other things to be able to buy it. According to my research all three of these rice cooking appliances are great to make brown rice. They are super popular and with excellent ratings among the consumers. At least these are the choices that I will choose to buy if I ever need the brown rice cooking feature. Can I Use Any Rice Maker To Make Brown Rice? How Long To Cook Brown Rice In a Rice Cooker? It looks like this cooker is a great choice to buy to cook brown rice. It has a lot of features that I want and is very similar to my current rice cooking appliance. You can make white, brown, sushi, and mixed rice. You can also use it to make sweet rice and porridge for breakfast. With this cooker you can choose between 5 and 1/2 cups or 10 cups uncooked rice. Of course, the price will be higher since it can hold more rice. The picture on the left is showing the 10 cups of rice. To read more reviews or check its current price for the 10 cups of rice, you may click on the image or check price button on the left. If you need the 5 and 1/2 cups of rice then you can click here to find out its current price. You can also click here to read my extensive review first before buying this rice maker. This NS-TSC18 model is another great choice for cooking brown rice. It’s going to look pretty sleek and cool on your kitchen counter. It has a lot more functions than the NS-ZCC18 and it costs less with the MSRP. To read more reviews or check its current price for the 10 cups of rice, you may click on the image or check price button on the left. If you need the 5 and 1/2 cups of rice then you can click here to find out its current price. You can also click here to read my extensive review first before buying this cooker. Okay, you may also want to ask what is the difference between these two models or may be having a hard time on deciding which one to get? They both have very similar features that can cook excellent brown rice. Of course, it also can cook white and mixed rice. These two rice makers are the same as the above rice cookers of the NS-ZCC18 and NS-TSC18 other than they are smaller in size. These two models have the same rice capacity of cooking 5 and 1/2 cups of rice. Well, here are the differences I found between these two models. In terms of price the MSRP for the NS-ZCC10 is higher and I think the reason is because it is made in Japan. The NS-TSC10 is made in China. Do you have a country preference? Some users think the one made in Japan has a higher quality and would rather pay the higher price. Here are the specifications for both models. First, the NS-ZCC10 model dimensions are 10-1/8″ W x 13″ D x 8-1/8″ H and the electrical rating is 120 volts/680 watts. The color is premium white. Second, the NS-TSC10 model dimensions are 10-1/8″ W x 14″ D x 8-1/2″ H and the electrical rating is 120 volts/610 watts. The color is stainless brown. Now I have created a comparison chart for both models for you to take a look at their features. I hope it will be useful to you on making the right decision. 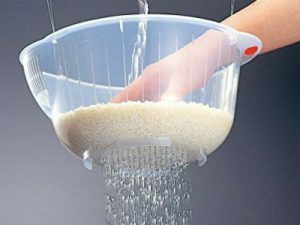 5 and 1/2 Cups Uncooked RiceThe ability to able hold up to the number of uncooked rice. Very HappyHow happy are the consumer rated this item? 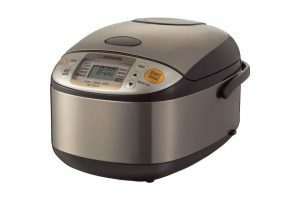 Rated Over 1300+The number of customers who rated this rice cooker. Nonstick Inner PotIs the cooking inner pot or pan a nonstick? Uses 680 WattHow much power does it use? Weight About 6.4 PoundsHow much does it weigh? 1 Year LimitedThe number of years warranty included. 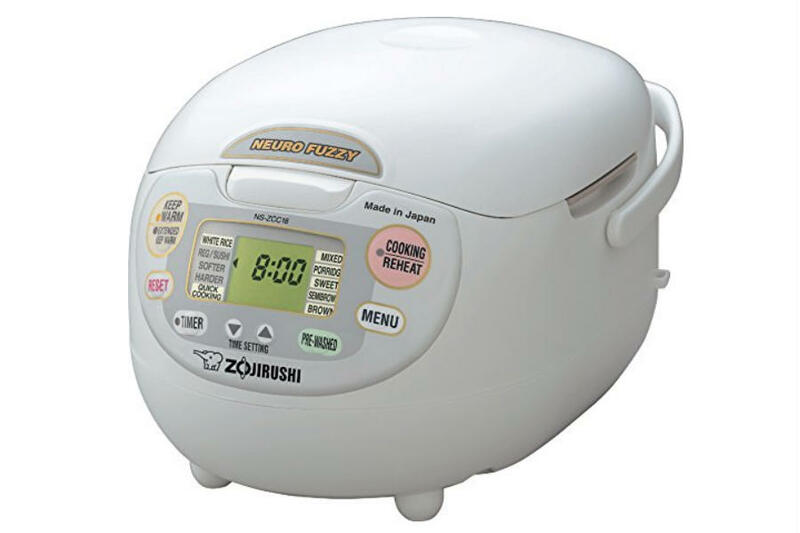 Rated Over 1100+The number of customers who rated this rice cooker. Uses 610 WattHow much power does it use? Power Cord Length 3.3 FeetWhat is the length for the power cord? Weight About 8 PoundsHow much does it weigh? The completed comparison chart with the help from Zorjirushi.com’s compared products feature. 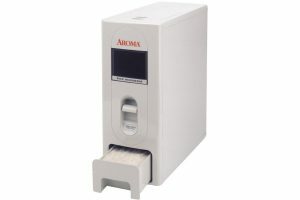 This Aroma ARC-150SB rice maker is also an excellent choice for making brown rice. It looks pretty simple to use with about five menu selections to choose from. The inner pot is non stick and removable, so it makes cleaning up a breeze and you can also put it in a dishwasher if you are not up to hand washing it. I usually hand wash them even though I have a dishwasher. I think the inner pot will last longer. What I mean is the non stick from the pot will last longer from peeling off. Click here for my full review. If you want your brown rice to taste good, you will need a rice cooking gadget that is designed to cook brown rice and not the simple basic one. Even if you are using the best high quality of brown rice it wouldn’t taste that good. That is just my opinion. That is really depending on the rice maker that you have. Different rice makers have different cooking times. It takes at least 1 hour and 25 minutes to almost 2 hours to make brown rice for the two Zojirushi cookers listed here. Some others are taking even more longer. So you have to prepare your brown rice a more earlier time before you are starting to cook dinner. If you don’t have the time to cook supper early then you can preset the time to cook it for you. Some of the rice makers have this convenient function. Best Small Rice Cookers - What Are The 4 Best Ones?